On even years, we trot RIGHT out of the driveway. On odd years, we trot LEFT out of the driveway. 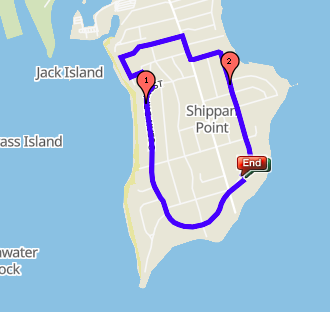 On even years, we take a RIGHT out of the driveway, trotting briefly downhill toward Hobson before approaching the even year’s version of Heartbreak Hill, all the way up Ocean Drive East to Shippan Ave. Carefully crossing Shippan Avenue, head north toward downtown and take your second left down Ralsey Road. Follow this all the way down until it becomes Ralsey Road South, keeping the Stamford Yacht Club tennis courts on your right. At Ocean Drive West, take a right and trot all the way around the peninsula until you reach and cross Shippan Avenue once more toward Ocean Drive East where the trot will conclude. Click here to view on g-map pedometer. On odd years, we take a LEFT out of the driveway, trotting across Shippan Avenue and holding right to continue on Ocean Drive West. At Ralsey Road South, take a left, keeping Stamford Yacht Club and its tennis courts on your left. Take Ralsey Road South until it becomes Ralsey Road approaching the odd year’s version of Heartbreak Hill. At the top of the hill, carefully take a right on Shippan Avenue, trotting toward the Point. 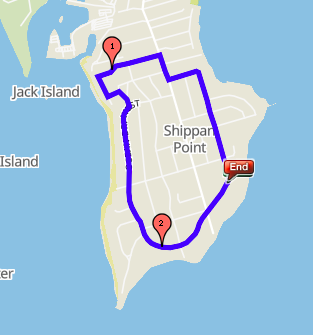 Take your second left on to Ocean Drive East and run down the hill toward the last half mile of the race.